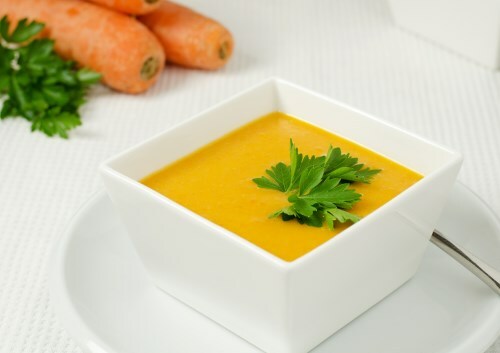 In large pot, simmer carrots and next 5 ingredients (through water), covered, until carrots are tender (20-25 minutes). Using an immersion blender (or a standard, blender working in batches), blend until smooth; add lemon juice. Divide among 4 bowls; garnish with crushed red pepper and carrot leaves. If desired, serve chilled.